To add search providers like Google Search provider add-on to Internet Explorer 10 alternative to default search provider Bing provides better results if you arenot happy with current search provider. This Internet Explorer tutorial show how to add a new search provider to your IE10 web browser on a Windows 8 PC and manage search providers like set as default search provider or remove it. In Internet Explorer 10 address bar, you can type a search string instead of typing a URL and press enter to search it on the web just like in many other web browsers. IE10 Internet Explorer will search the web for the given search string using the default search provider which is Bing search provider which is shipped with IE10 by default. 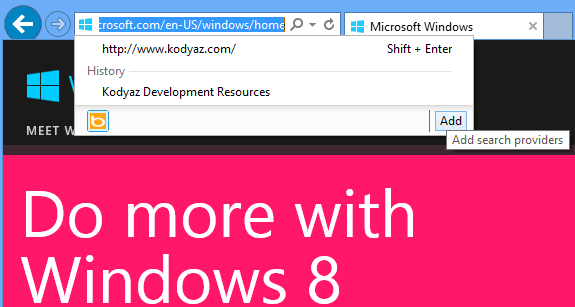 When Internet Explorer 10 is first used on a new Windows 8 PC, Bing is the default search provider on IE10. You can see the Bing icon and the Add button at the bottom of the dropdown list when you press the URL bar Search icon or press Crtl + E short-cut combination. But if you want to use other search providers, which means other search engines like Google, Yahoo, ASK, etc. IE10 users can also add search provider to their web browser and set any of them as default search provider for their browser. As you see there a numerous alternative search provider add-ons for you to install for your IE10 browser. 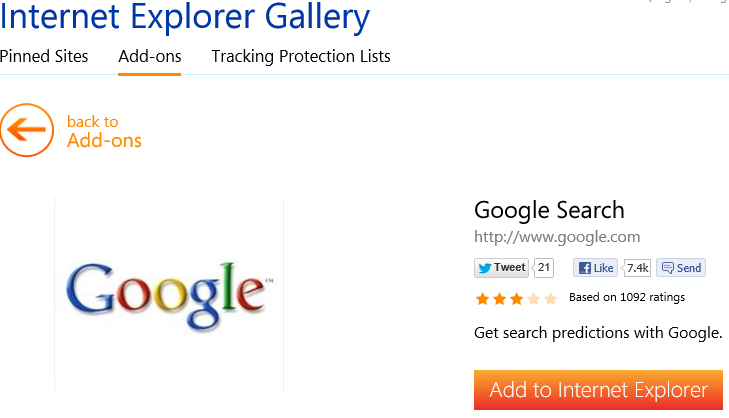 As a sample, I choose Google Search Provider as a new search engine add-on for my Internet Explorer browser. Click on the search provider listed on the search providers add-ons page. You can check details about the new search add-on on this page, if you are satisfied with your selection you can press Add to Internet Explorer button. Then following Internet Explorer 10 dialog box will be displayed in order to request your approval for Google search provider add-on installation. If you want you can mark the "Make this my default search provider" checkbox to use this search engine as your default search engine. You can also later change your default search provider following Tools > Manage add-ons > Search Providers menu options of Internet Explorer 10 When you press Add button, new search engine provider will be installed on IE10 and is going to be listed in the search box in URL bar as an alternative search engine provider. I use at least Google search provider, Yahoo, Yandex and Bing search provider among my IE search providers list. I can suggest all those to you as well. Highlight the search provider you want to set as default among other search engine browser providers. After you make your selection, on the bottom-right corner of the screen Set as default button will be active. Press this button in order to change your web browser's default search provider to the selected one. 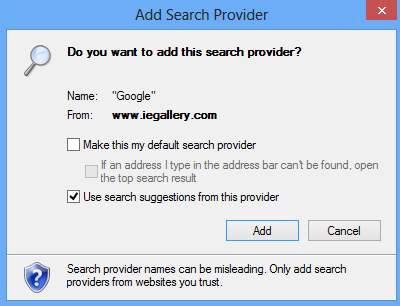 If you do not want the search provider to be listed with others in search bar, you can uninstall or remove search provider again from the same configuration screen. Besides Set as default button there is also a Remove button. You can use Remove button to remove search provider add-on that is no more required on your Internet Explorer 10 web browser.